"In 1919, a new sport was introduced at Wakefield High School which enabled girls to 'indulge in the history of competitive athletics.' Through the efforts of the Athletic Association, arrangements were made with the YMCA so that the girls 'might use the gymnasium on Thursday from 1:30 to 4 p.m. and 6-7 p.m. for basketball practice.' Forty girls took advantage of this opportunity under the direction of Miss Hester Sharkey. Two teams were organized from each of the three upperclasses, and interclass games were played. No games were played out of town. By the 1950s, annual games with Woburn, Stoneham, Wilmington, and Our Lady of Nazareth Academy were added to the schedule. The number of players increased over the years, with 70 girls participating in 1952, and 130 in 1954. The 1960-1961 school year marked the beginning of interscholastic competition for the WHS girls basketball team. Early schedules included varsity competition against North Andover, Malden, Marblehead, Beverly, North Reading, Saugus, Melrose, and Stoneham. 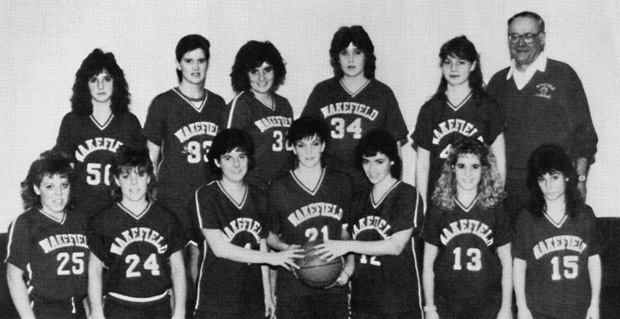 The WHS girls' basketball team has had its share of success over the years, especially during the late 1970s, and throughout the 1980s and 1990s. The team captured the Middlesex League championship several times between 1979 and 1988, and was crowned Division II state champions in both 1988 and again in 1997. Both championship games were played against Monument Mountain." -- Text from calendar. The 1988 State Championship girls' basketball team. (Front row, left to right) J. Gerrior, J. Gerrior, M. Sydlowski, S. White, L. Plansky, M. Chase and D. Serrecchia. (Back row, left to right) C. Marchand, M. Whiting, E. Bode, H. Allen, J. Green, and Coach Bernie Plansky. “Girls basketball,” NOBLE Digital Heritage, accessed April 22, 2019, https://digitalheritage.noblenet.org/noble/items/show/6953.